I admit it... I'm a night owl. I'm always researching something online or putting certain information together because it's interesting and fun for me. 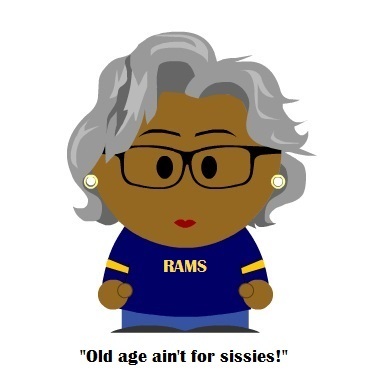 I give myself these time-consuming and tedious projects i.e., making a South Park character for each Rams player & coach, tracking down all Rams draftees since the year 2000 or finding music from Disney movies to put on my iPod so I can play it whenever Everett is in my car (my current project). I'm usually so into what I'm doing that I lose all track of time. Before I know it, I'm crawling into bed around 3 or 4 am. I went to bed this morning at 5 am and woke up at 9 am. On Mondays and Tuesdays we are still Nannie & PaPa daycare and I have to get up around 6:30 am so it makes for a really short night. The rest of the week, I may sleep until around 8 or 9 when I don't have to "go to work". But I also crash for an hour or so in the evening while sitting at my desk because this old girl just can't hang like that day after day like I used to. I have no idea what it's like to sleep for 8 hours. I haven't done that in years. I read once that the comedian Jerry Lewis only slept about 2-4 hours a night, too. He said he didn't want to go to sleep because he felt like he'd be missing something. What about you? How much sleep do you get?